We have an extensive range of DISHES to suit every requirement with large stock levels for speedy despatch. Recessed Dish - Unpunched. Material: 1 mm Steel, Black Powder Coated. ..
Large Dish with Horizontal Louvre Material: 1.2mm / 18 gauge Steel Dish Depth: 16m.. Medium Dish Punched for 1 x Neutrik D-Series Connector (XLR, Speakon, RJ45, etc. ), 1 x Neutrik P-..
Recessed Dish - Unpunched. 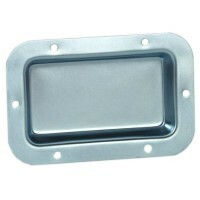 Material: 1 mm Steel zinc plated. Cutout 65 x 115 mm. ..
Recessed Dish - Unpunched. Material: 1 mm Steel black powder coated. Cutout 65 x ..
Recessed dish with crosswire slotted rubber flange to pass through connectors and cables. ..